Happy Friday, friends! I’m super excited about today’s post because I’m partnering with PacSun to share TWO adorable ways to style white denim shorts! With summer in full swing and back-to-school style on the horizon, I’m featuring a couple of weekend-wear looks to get you through the summer heat and beyond. Did I mention my shorts & top are “buy one get one 50% off?” Yep. You need these – they’re amazing and SO COMFY & CUTE. (…And worthy of all caps, apparently! 😉 ). Psst…PacSun is running a BOGO Half Off Sale on a TON of tops/shorts/dresses, definitely check out the sale here! My sister and I did a little food trailer hopping and ended the night with a blue coconut (topped with cream) snow cone from our favorite, Sno Beach! Shoutout to Kimberlee for snapping some cute photos while we strolled around Barton Springs Road – how good is she getting? Killing the photog game right now! Funny story: we both used to work at Sno Beach back in our teen + college days. It took all our might not to ask for 20 samples when we stopped by this time around, ha! 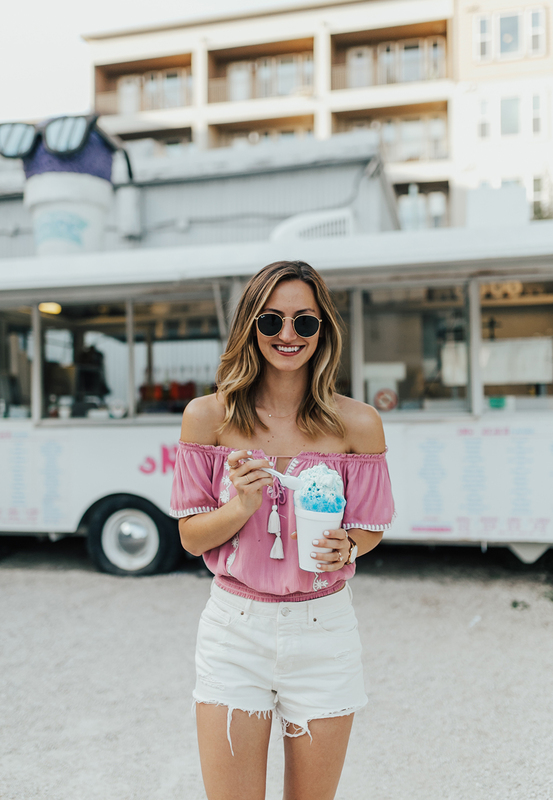 Anyhoo – if you visit Austin this summer, this snow cone stand is an ATX staple and so delicious! Aaand back to my outfit details we go! 😉 How perfect are these white denim shorts (order a full size down, they run big! I am normally a 25 but the 24 fit much better. These shorts are SO PERFECT, trust me!!) paired with an off-shoulder boho top by LA Hearts (love this brand – just $29!) and Van’s sneakers? I firmly believe Van’s can do no wrong…such awesome, playful, timeless shoes and clothing. My shoes are the off-white color and I am loving them! Would be equally adorable paired with a flowy summer dress, too. Given that I am all in when it comes to casual style (…see what I mean when I say this city is ultra casual? There are food trailer eateries everywhere! Not exactly a cocktail dress situation haha), I opted for a striped tank (just $34 by Van’s…in love with this! ), strappy sandals, a bandana for some colorful flair, and of course a felt fedora hat. This would be a perfect look for a day strolling along South Congress doing some local shopping, or for sipping a chilled drink at an outdoor concert. You can find both looks at PacSun! True story: since receiving these pieces in the mail, I have since scoured the website and ordered a few more items (…can’t resist a good sale, either! )…LOVING how relaxed and adorable their clothing is, plus they carry brands I have loved for ages. If you’re in need of some shorts and go-to tops that won’t break the bank, check out more from PacSun here. A big thank you to PacSun for sponsoring this post! As always, all opinions are my own. Cute outfit’s. Love the white shorts and the way you made multiple outfits out of them. I especially like the outfit with the stripe tank top, hat, and the sunglasses you put with it. Thank you for sharing. Thanks so much, Jody!! It was a fun one to style – definitely felt like a very “Austin” outfit! Have a wonderful weekend, XO! White shorts are a must for the summer! Such cute and comfy looks! Love them! How adorable are you?! Love this little pink top + the location couldn’t be cuter! How fun that your sis took the photos too! Love your styles! You are looking stunning. These are the best ways to rock with white denim shorts. I am so excited to try them. Thanks for sharing.